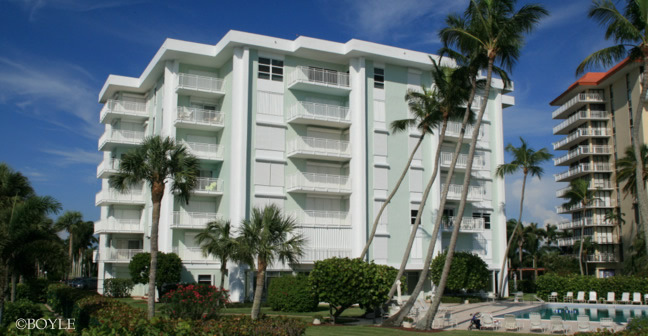 Emerald Beach condominiums are located 500 Saturn Court on beautiful Marco Island, Florida. These unique, classic condominiums were built in 1967 and have 48 units spread over 7 floors. The square footage varies from 687 to 753. These are not just simply dwellings, but they are home to an extensive family-unit of owners who care about this classic building and the memories that are attached to it. Emerald Beach amenities include one of the largest swimming pools on Marco Island complete with a sunning deck and gorgeous tropical views. Guests here enjoy a recently updated activity area for gatherings and parities. There’s even a library to exercise the mind. When owners have added guests, there is also a visitor’s suite on-site for them to utilize. An impressive lobby with inclusive traditional woodwork in the upstairs halls, these condominiums offer all the comfort of home. Emerald Beach Marco Island, as its name suggests, is a gem. It’s an oceanfront treasure, which has everything to accommodate the vacationer, or anyone who has dreamed of relocating to southwest Florida. The beautiful crescent beach of Marco Island and Emerald Beach Condominiums can be a home away from home. Marco Island real estate opportunities abound. Call us. Monthly maintenance fees for Emerald Beach condos range from $387 - $697 depending on square footage and whether or not the unit is a one or two bedroom The maintenance fee includes your standard items as well as water and sewer. Cable is extra at a bulk rate of $35/month. Pets are not allowed at Emerald Beach. If bringing your pet with you is non-negotiable, try the Gulfview. Priced comparably to Emerald Beach, pets up to 20 lbs are allowed there. The minimum rental period in Emerald Beach is 30 days. While not the most popular choice for rental income, investors can still hope to get $5000-$8000/month, in season, for condos here. There are four different floor plans in Emerald Beach, 2 one-bedroom plans and 2 two-bedroom plans. Click here to see all Emerald Beach floor plans.